Franklin and Sterling Hill, N.J.
By Richard Bostwick, with the assistance of Earl Verbeek, Mark Boyer, Paul Shizume, Steven Kuitems, Richard Keller, Paul Carr, and others. The Franklin-Sterling Hill area has more fluorescent minerals than anywhere else on Earth, and nothing is simple at this locality. This checklist is not a treatise, so the descriptions are condensed and simplified. The most common fluorescent response is listed first. 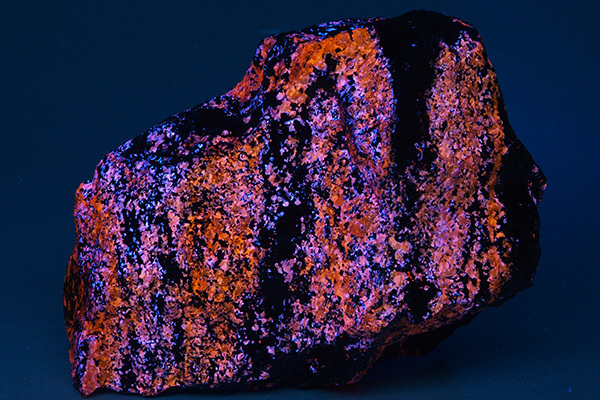 The UV wavelength or wavelengths listed for a mineral are those under which its fluorescence is brightest; “FL red SW” means that the mineral typically fluoresces red in shortwave UV, but may fluoresce less brightly under MW and/or LW. (Uncommon but significant fluorescences are in parentheses.) Subtleties such as fluorescent hue, saturation, and intensity are usually not mentioned. Not all local minerals fit neatly into this scheme. CAVEAT: while mineral fluorescence can be a powerful tool for mineral identification, it should be used in conjunction with other identification techniques. Misidentifications based on fluorescence alone are common. Mineral nomenclature in this fluorescent mineral checklist conforms to the 2015 list of local mineral species compiled by the FOMS Mineral List Committee. Comments about the fluorescent mineral checklist can be e-mailed to rbostwick@att.net.